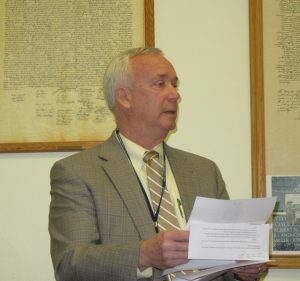 The Bradford County Commissioners proclaimed April 8 to 14 as Telecommunicators Week, and Robert Barnes (above) visited the courthouse in Towanda to provide a recap and an update on the county’s 911 Center. Bradford County EMA director Robert Barnes shared some sobering statistics with those in attendance at the April 11 meeting of the Bradford County Commissioners. Telecomunicator’s Week is being recognized across the state, and the commissioners asked Barnes to read the proclamation, after which he explained how vital the EMA and the 911 dispatchers had been in 2019, especially during days of flash flooding in August. 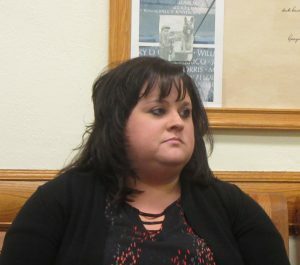 Barnes noted that the County 911 Communications Center in North Towanda is the only public service answering point for emergency calls and people seeking general assistance in Bradford County. An impressive total of 102,088 calls were processed by dispatchers in 2018, representing a 2.7% increase over the previous year. The busiest day for 911 in 2018 was on Aug. 14, when dispatchers handled 753 calls in a 24-hour period. During the five day period from Aug. 13 to 18, 753 calls were placed to 911 concerning the flooding that resulted in Bradford County receiving an official federal emergency declaration. An average of 26 calls per hour were processed over the same period of time. Barnes was happy to report that construction of a new emergency operations and public safety center is underway in North Towanda Township, and noted as well that new dispatchers are always needed. “It’s a noble career,” said commissioner Doug McLinko, who encouraged those interested in the job to contact Barnes directly at 570-265-5022. 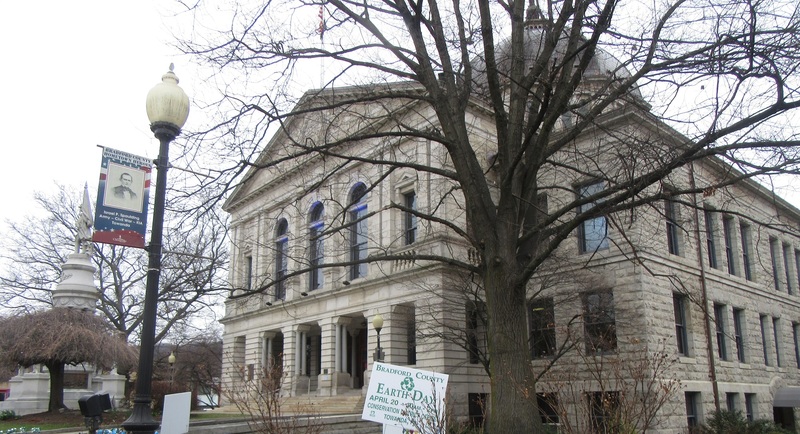 Public officials and those visiting the Bradford County Courthouse on April 11 were given an opportunity to try out the county’s new voting machines that were set up in the main lobby. McLinko credited elections director Renee Smithkors for putting a lot of time into the purchase and programming of 185 new Freedom Vote Tablets, which McLinko noted was an unfunded mandate by the state. Additionally, 55 voting slip scanners were purchased, which will tabulate the paper ballots. A QR code activates the ballot marking device, and the statistics are communicated via a transfer media unit. “Part of the paper process is that the voter gets a piece of paper to confirm their own votes,” commissioner Ed Bustin added. Smithkors related that the public can try out the machines, which are currently programmed with a mock ballot featuring famous Pennsylvanians at Chemung View Apartments today (Wednesday) from 1 to 4 pm and at the Conservation District/Stohl Center building in Wysox on Tuesday, April 30 from 5 to 7:30 pm. There is also a machine set up in Smithkors office in the courthouse annex that can be accessed any time during regular courthouse houres. Training classes for poll workers will take place in the coming weeks. National Library Week was also observed by the commissioners. Bradford County Library System representatives shared so much great news about upcoming events that it will be posted on EndlessMtnLifestyles.com as a separate story.